When you return from a holiday, the next few months are spent delighting your friends by reliving your holiday experiences and your new knowledge of these places. With New York City and San Francisco fresh in my mind, I repeat my experiences and knowledge of the place gained from experienced tour guides, travel brochures and blogs, eagerly wanting to share my love and amazement of this city. For example, I never knew that Manhattan had grown in size and shape with landfill and rubble. This city has changed significantly over the last 150 years. Manhattan translates to “island of many hills” but it’s not hilly, well not anymore. Manhattan’s geology is mainly bedrock that lies closer to the surface in midtown and downtown, which is why it is suitable for building very large skyscrapers close together in these areas. Downtown Manhattan has grown substantially and in fact, the material dug out from building the World Trade Centre extended Manhattan Island even further. So in the photo of Downtown Manhattan on the left, with the new unfinished World Trade Centre (or Freedom Tower) in the centre, I think that if I have my orientation correct, most of the right half of this is the extended part of the island using landfill and bedrock rubble. 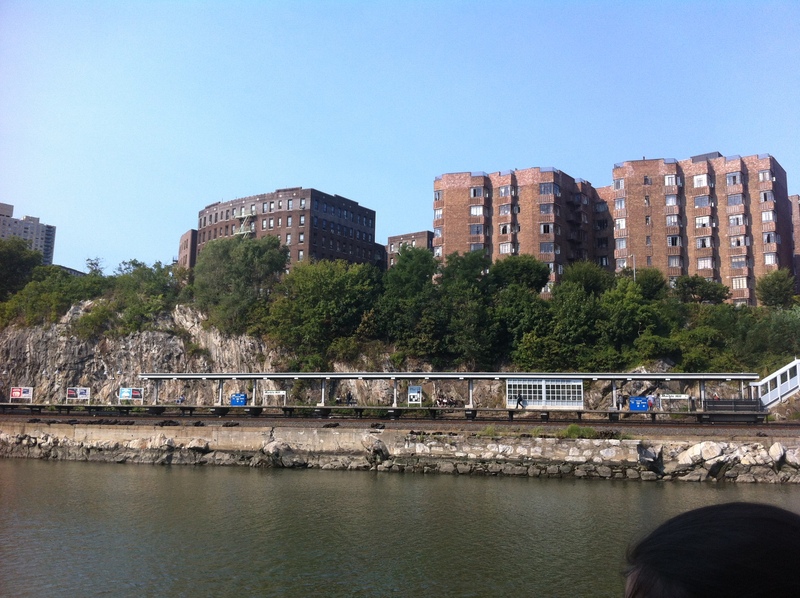 In fact, on the opposite end of Manhattan Island and across the waterway (called Spuyten Duyvil Creek) in the Bronx is Marble Hill, which initially joined Manhattan but this was separated from the island for easier access through the waterways then refilled with landfill and then separated again. The river, which is more like a narrow canal at some points at this end, separates Manhattan from The Bronx and Queens. Manhattan is made up of a grid of 12 numbered avenues running north and south, with First Avenue on the east side and Twelfth Avenue on the west side, and 220 crosstown streets. The only street that is not part of the grid is Broadway that runs diagonally from Lower Manhattan (Downtown) going uptown and across the river to the Bronx. This grid is where the term “Gridlock” comes from, which is when traffic is congested to a standstill due to traffic stopping in intersections and blocking through traffic around a block. The “hills” were removed to build the grid of roads. There are other street names including A, B, C and D Avenues, Houston Street and Wall Street. Fifth Avenue divides the Eastside from the Westside of Manhattan. Most streets are one way, odd run west, even run east. 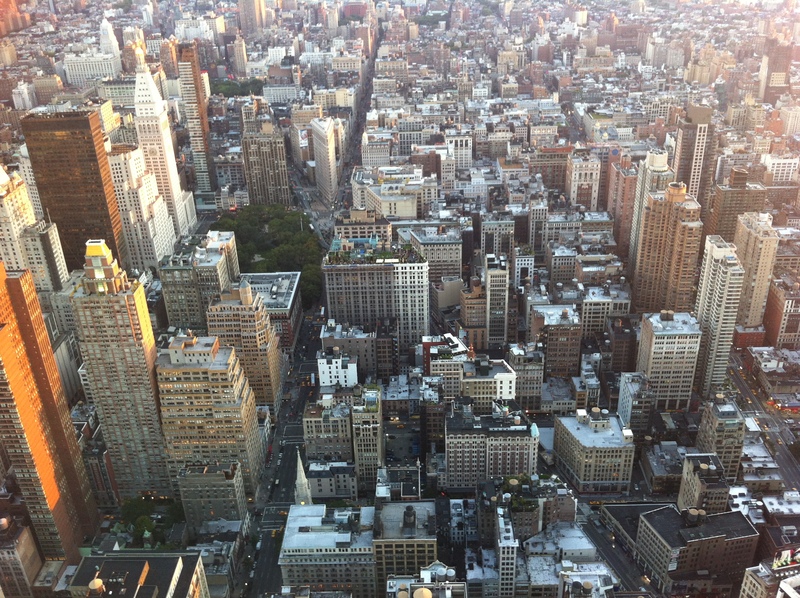 Looking down Fifth Avenue and Broadway from the Empire State Building. The Flatiron building is where Fifth and Broadway intersect (and across from Madison Square Park). The grid system is very useful to quickly orient yourself with New York City. It’s a huge city. In fact everything in New York is BIG! The people are big, not in size but in their warmth and friendliness. In the centre of Manhattan is the appropriately named Central Park. The 843 acres (341 ha) that make up Central Park, like San Francisco’s Golden Gate Park (which is 20% larger than Central Park at 1,017 acres or 412 ha), was designed and created with input from NYC residents. There are four different types of bedrock underlying Manhattan and when building Central Park they needed more gunpowder than that used in the Battle of Gettysburg (however much that was) to flatten it, unlike Golden Gate Park, which was built on uninhabited sand dunes. Work started on building the park in 1857 after 1,600 residents were evicted from the area. Most of these residents were poor. After removing the infertile soil and rock and replacing with 14,000 m³ of topsoil, four million trees, shrubs and other plants (1,500 different species) were transplanted to the park, which was officially opened in 1873. While Bison have been kept in a paddock in Golden Gate Park since 1891 as part of a breeding program as numbers were diminishing across the US, Southdown and Dorset sheep grazed in Central Park from 1860s but needed to be relocated during the depression for fear of them being killed and eaten. The sheep were there to add to the English quality of the park and not as part of a breeding program however they did help in trimming the grass and fertilising the lawn. Part of this section of Central Park is still called the Sheep Meadow now used for large concerts and a restaurant was built on the other section. 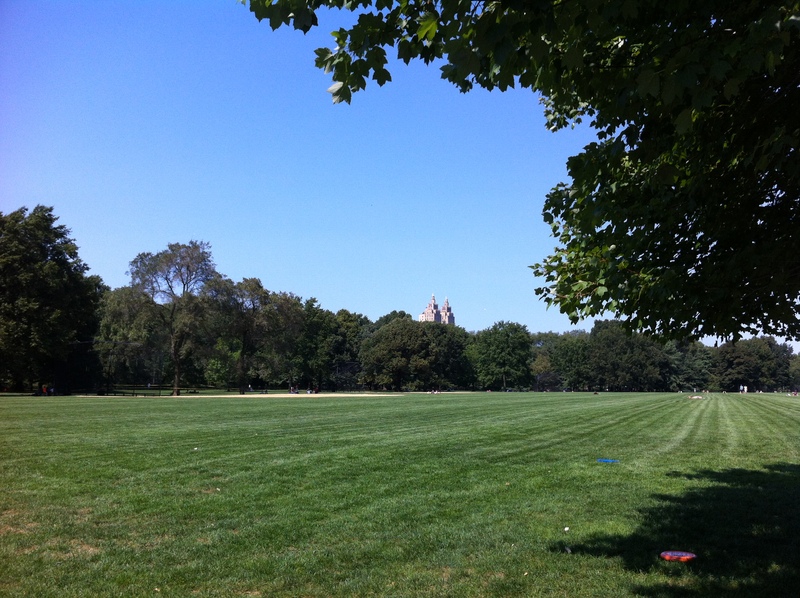 Sheep Meadow was originally rocky and swampy terrain and was transformed into a flat section of lawn during the construction of Central Park. During my holiday, I took an Uptown bus tour that takes you around the park perimeter, walked past it on a visit to the Guggenheim, Naomi and I rode around the park which took us two hours with stops on a different day and I spent a morning walking through part of the park on my own on another day. My walk through Central Park was from the 7th Avenue on the southern end to the lower west corner, up through Strawberry Fields, taking the subway from the Dakota Building to the American Natural History Museum (one stop). After visiting the museum, I walked across the park (via via the Delacorte Theatre where Shakespeare in the Park is performed and the Great Lawn), across to the west side of the park in time for a nice lunch on Fifth Avenue (where this section is called museum mile). I headed over to the Neue Galerie , a museum devoted to 20th century German and Austrian art and design, where I was told there was told I could get a great lunch (at Café Sabarsky). Not only was lunch delicious , the cafe building was beautiful and I was dining in the company of Roger Federer. After lunch, I caught up with Naomi for a visit to the Metropolitan Museum of Art where we continually got lost. This visit finished on the roof of the Museum with a Metropolitan before heading off for dinner. You could spend your whole holiday in New York City just exploring Central Park or going to museums and on tours learning about its history. All pretty amazing and I could go on and on about what learnt about this city during my two week stay. So although I only had a three week holiday, I will continue to relish it, with this being a snippet of the stories I have from my holiday to share.